Each weekday before the DCI 2005 Classic Countdown, we'll be running first-person accounts of the seasons and the shows that will be featured in that event. Here's the sixth installment: By Chuck Helbush What was it like with the Blue Devils in 1976? What individual insight can be given by one who was there? It really was a joy to be part of this corps. Blue Devils were on the rise and they were rising fast. To give just a snapshot history (for those who haven't heard), the Blue Devils were newbies. Granted, the organization had been around since the late '50s, but Jerry Seawright had the vision to take a drum and bell corps (that's right, glockenspiels) where the grand finale was the state championships and give them horns. Word has it he did this with his own money even before the Blue Devil Board had given approval. This shows how much Uncle Jerry thought of this group. This happened in 1970. Yes, Uncle Jerry did get reimbursed (I believe). 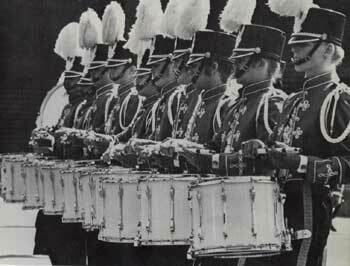 The Blue Devils in 1976.